This machine is a sewing ambassador. There I was, browsing through my then-fave antique furniture dealer/restorer, telling myself I didn’t need any more furniture. Then I came upon this. The hand crank turned easily, and all the parts appeared to be there. The price seemed low. I’d never worked with an antique machine, and my curiosity quickly won out. This was more than 15 years ago. The internet was still new enough that personal web pages consisted of a lot of plain text and a few little photos. But lucky me, a few people had done DIY pages on bringing an old Singer back to life. All it took for this one was some sewing machine oil, and careful cleaning of the head, to not ruin the decals. A universal bobbin and needle were all the parts I needed. Soon it was sewing beautiful stitches on a test scrap. The decals are the “Lotus Petal” design. The serial number is stamped on the base, in nice big numbers. There is a little storage compartment under the hand wheel, for holding attachments, etc. I love looking in the storage compartments of old machines. They are like opening a time capsule. There were a few specialty feet in this compartment. I confess, I still haven’t used them. I need to make that a future fun project. 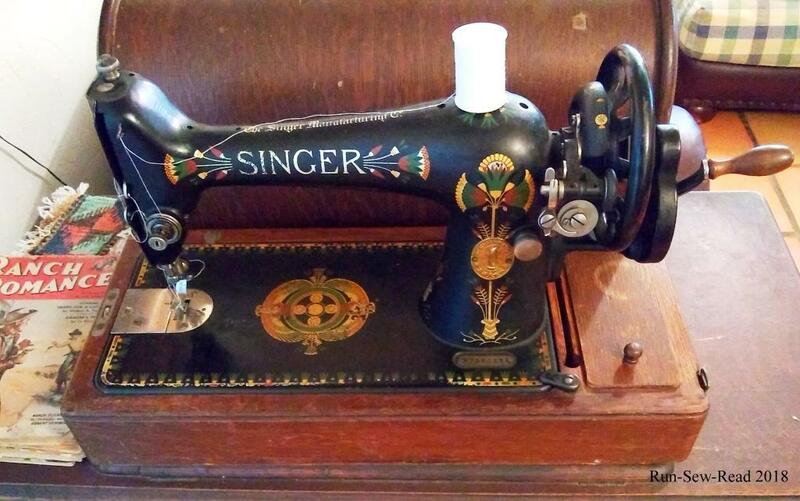 There was also an online database of Singer serial numbers, that quickly told me this machine is a Model 66k; one of 75,000 manufactured in Clydebank, Scotland, in 1917. Around the same time I got the machine, I acquired a little stack of scrappy stars in another antiques shop. In keeping with their vintage status, I decided to assemble them into a quilt top using my ‘new’ hand crank sewing machine. Then, I taught myself to hand-quilt. Then I took the finished quilt into the shop where I’d bought the stars. The owner got choked up, and told me her mom had made the stars. She loved how I framed them in red and muslin. 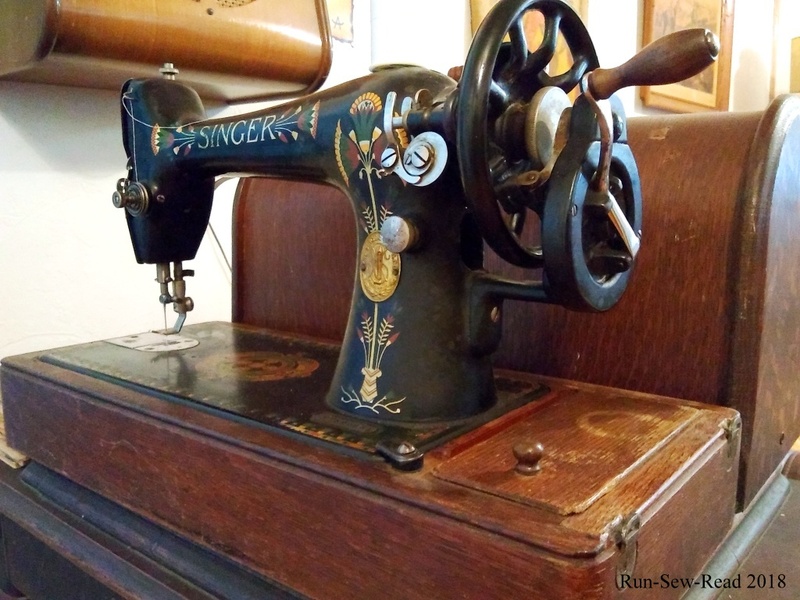 The sewing machine currently resides in my sitting room, on top of a treadle base. 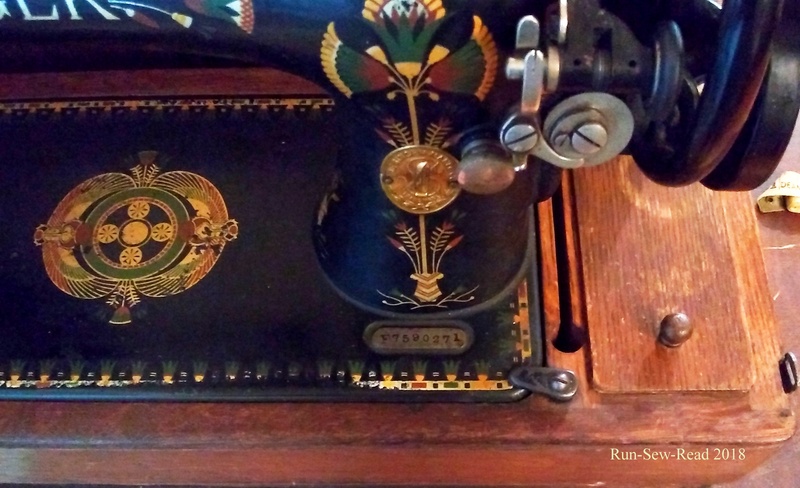 There is another antique sewing machine folded up in the treadle base. This first purchase and all of the wonderful experiences that came from it, caused me to buy more old Singers and put them back into ‘service’. My feeling is that they need to be re-appreciated, and used occasionally. And that’s a duty I thoroughly enjoy. This hand-crank machine’s most recent use was at a workshop where outdoors enthusiasts were learning to make custom straps with buckles, adjusting slides, and other embellishments, for camping, hiking, and biking. A small bit of straight stitching on the straps was optional. This sewing machine being non-electric, low-tech, and virtually unbreakable, was not threatening to people who had never sewed, or who’d had a bad first sewing experience. Everyone opted to take a turn with it. I think I (or more likely, the machine) successfully recruited some sewing newbies that day. I love old machines…to me I look at it and see a kind of art you don’t see anymore. I go to yard sales and flea markets to find things to bring them back to life…That was an awesome find. Thanks! Even as a kid, I was fascinated with old sewing machines, This was when I finally got one to tinker with myself. More came after this one! Wow – my grandmother had one that looked similar, without the decals, I think. And her was electric – it had a black C- shaped piece on the right that you pushed your knee against to make it work. Very cool find & way to go- fixing it up and sharing it! What a beautiful machine! I love the Lotus decals, the colour still looks amazing after all the years! And the story about the quilt you made with the stars made me teary eyed – but then you had me laughing out loud with the hilarious Betty Hutton video! Wonderful post! Thank you! The quilt still has a special place hanging on my wall. It’s fascinating how it has connected people through time and space. That video is OTT, isn’t it? Wow.